Sorbet served in the middle of a meal is kind of an old workhorse at this point. But it's not something I've ever done, and certainly comes as a surprise, especially when it isn't on the menu. I wanted something different, and had a rosemary infused sorbet a few weeks prior to the dinner, so that was the basic launching point. I started this with a google search to get some basic formula ideas. I managed to find someone who I used to work with! 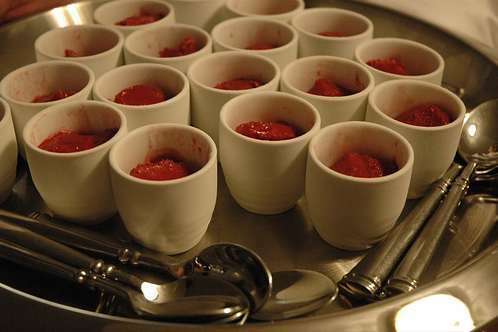 Another issue for a party is how to serve something tiny like this. You can't ask people to serve themselves, as this defeats the purpose of a surprise cleansing course such as this. I ended up finding sake cups on line for 70 cents each! They were just the right size, and cheap enough that buying 50 was no real issue. I'm sure I'll be able to use them again for other parties, so it worked out very well. After that, it was just a matter of portioning the sorbet the day before, re-freezing until service, and finding a pretty silver platter for walking around. Oh yeah, don't forget the spoons, because up until this point the guests probably haven't been grabbing them. I actually put "spoons" on my prep list so that we wouldn't forget. 1) Cook rosemary, water, and sugar over medium low (should simmer, but not boil) for about 5 minutes, or until you obviously smell the herb. Remove rosemary at this point via tongs.